Combs is a large parish, and although there is a remote, pretty village that takes its name up in the hills, the bulk of the population of the parish is down in the housing estate of Combs Ford in suburban Stowmarket. Consequently, this church is often busy with baptisms and weddings, and can reckon on a goodly number of the faithful on a Sunday morning. 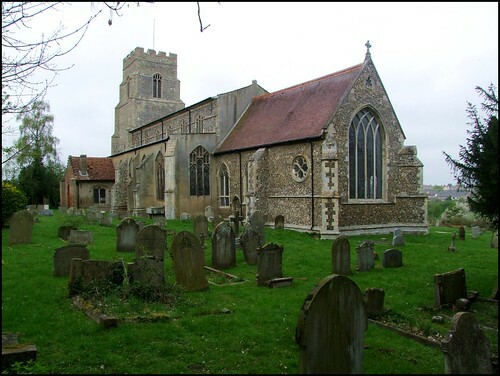 St Mary is on the edge of the housing estate, but the setting is otherwise profoundly rural: you reach it along a doglegging lane from the top of Poplar Hill, and the last few hundred yards is along a narrow track which ends in the wide graveyard. The church is set on low ground, hills rising away to north and south, and the effect, on looking down at it, is of a great ship at rest in harbour. This remoteness, coupled perhaps with a view of the purpose of the building which is rooted in evangelicalism, does not encourage the parish to keep the church open to pilgrims and strangers. And so, both artistically and historically, this is probably the most important church in all East Anglia which is kept locked without a keyholder notice. Be that as it may, access is possible if you ask nicely, and so I freewheeled down the steep hill from the top road towards the church in the valley below, the big key in my pocket. With its grand tower, aisles and clerestories this is a perfect example of a 15th Century Suffolk church in all its glory. In the 1930s, Cautley found the main entrance through the south porch, a grand red brick affair of the late 15th century. It has since been bricked up, and entrance is through the smaller north porch, which faces the estate. The gloom of the north porch leads you into a tall, wide open space, full of light, as if the morning had followed you in from outside. The first striking sight is the three great bells on the floor at the west end. They represent the late medieval and early modern work of three of East Anglia's great bell-founding families, the Brayers of Norwich and the Graye and Darbie families of Ipswich. The largest dates from the mid-15th century, and was cast by Richard Brayser. Its inscription invokes the prayers of St John the Baptist. The other two come from either side of the 17th century Commonwealth; that by Miles Graye would have been a sonorous accompaniement to Laudian piety, while John Darbie's would have rung in the Restoration. It is fascinating to be able to see them at such close quarters. 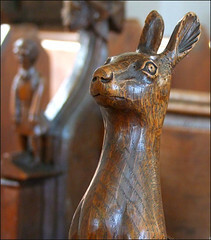 Stretching eastwards from the bells is the range of 15th century benches with their predominantly animal bench ends, some medieval and some clever Victorian copies, probably by the great Henry Ringham. The effect is similar to that at Woolpit a few miles to the west. The hares are my favourites. One is medieval, the other Ringham's work. They seems alert and wary, as though they might bolt at any moment. Clearly, the medieval artist had seen a hare, but lions were creatures of his imagination. The great glory of this church, however, is the range of 15th century glass towards the east end of the south aisle. It was collected together in this corner of the church after the factory explosion that wrecked most of Stowmarket and killed 28 people in August 1871. The east window and most easterly south window contain figures from a Tree of Jesse, a family tree of Christ. Old Testament prophets and patriarchs mix with kings, most of them clearly labelled: Abraham and his son Isaac wait patiently near the top, and Solomon and David are also close companions. This second window also contains two surviving scenes from the Seven Works of Mercy, 'give food to the hungry' and 'give water to the thirsty'. 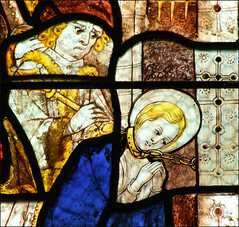 But the most remarkable glass here consists of scenes from the life and martyrdom of St Margaret. We see her receiving God's blessing as she tends her sheep (who graze on, apparently unconcerned). We see her tortured while chained to the castle wall. We see her about to be boiled in oil, and most effectively in a composite scene at once being eaten by a dragon and escaping from it. Under the vast chancel arch is the surviving dado of the late 14th/early 15th Century roodscreen, a substantial structure carved and studded with ogee arches beneath trefoiled tracery, the carvings in the spandrils gilded. At the other end of the church, the font is imposing in the cleared space of the west end. It is contemporary with the roodscreen, and the suggestion is that we are seeing a building that is not far off being all of a piece: the fixtures and fittings of a new building roughly a century before the Reformation. A period of history not otherwise much represented here is that of the early Stuarts, but a brass inscription of 1624 reset on a wall had echoes of Shakespeare for me: Fare well, deare wife, since thou art now absent from mortalls sight. One of those moments when the human experience transcends the religious tussles of those days. Outside in the graveyard, two other memorials caught my eye. One dates from 1931, and remembers My Beloved Sweetheart Stan... who died in Aden aged 22 years. Not far off, a small headstone of the late 17th Century records that Here Restesth ye body of Mary, ye wife of Tho. Love Coroner with two still born Children. I stood in the quiet of the graveyard, looking across to the suburbs of the busy town of Stowmarket, and I felt the heartbeat, the connection down the long Combs Ford centuries. Behind me, there was something rather curious. Although this is a big graveyard, the church is set hard against the western edge of it. Because of this, a processional way was built through the base of the tower by the original builders, as at Ipswich St Lawrence and Stanton St John. This would have allowed medieval processions to circumnavigate the church on consecrated ground. The way here has since been blocked in, and is used as storage space. A surviving stoup inside shows that, through this processional way, the west door was the main entrance to the church in medieval times, when this building was the still point of the people's turning world. What on earth would they have thought to find it locked today?